To assign a task to a specific person, click on the task card on the image or alternatively on Select resource… and choose a resource from the address book. Then click on Select -> and confirm with OK. Tip You can filter the resources in the global address book by specific skills, e.g. when the task can only be completed by someone with English language skills. Please go to the chapter Skills to learn how to assign specific skills to a resource. If you want assign the task to a resource later, you select the task on the Kanban board, then click in the Ribbon on the Edit tab on the Select Resource button and choose the right person from the global address book. If the task has already been assigned to a resource, it will be replaced, because only one resource can be in charge of a task. If you want to withdraw the competence for a task from a resource, you select the respective task, then click in the ribbon on the Edit tab on Remove Resource. Warning The division and team functionality is only available in InLoox 9 Enterprise Server or in InLoox now! Enterprise. If you are able to choose from a multitude of resources the divisions and teams view helps you to keep a better overview. Click in the tasks section of the project on the Edit tab and in the ribbon on the Divisions and Teams button. This will open the Divisions and Teams overview in the side panel on the right. The InLoox Administrator can set the division and team structure in the InLoox options. You can expand the division structure by clicking on the black arrow in front of the division icon to see all resources that belong to that division. Now drag the respective resource on the task that you want to assign. The workload of the task will now be included in the calculation of the resource’s workload and in the workload of the division. Besides the divisions that the InLoox Administrator sets for the entire project platform, you can create your own teams in InLoox and track their workload. The team functionality helps you to put resources together across divisions. In the tasks section of a project, click the Edit tab and in the ribbon on the Divisions and Teams button. In the Divisions and Teams side panel, click on the plus symbol left of Add Team. A new team will appear below. 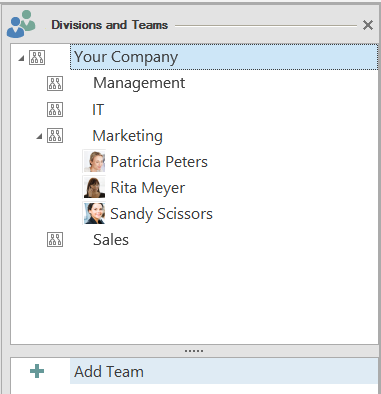 Now you can drag and drop resources from your team onto the respective tasks. The workload of the task will now be included into the calculation of the resource capacity and in the calculation of the team capacity. Note The new team is now available in each of your InLoox projects, but it is not available system-wide – meaning that your colleagues won’t be able to use the team. Every user can create his or her own teams. Assign tasks to resources | InLoox 9 for Outlook • Copyright 1999-2019 © InLoox, Inc. All rights reserved.